Capture the fierce protection and love you have for your children with this mama bear and cub necklace. 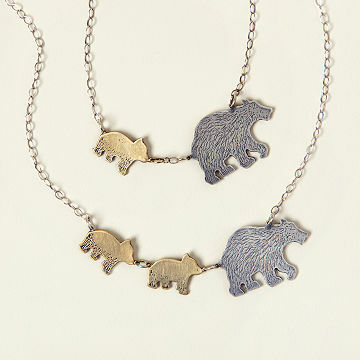 Inspired by her own mother's protective nature, Britta Ambauen designed this sweet bear and cub necklace. "She's always been fiercely protective of my brother and me," she says, "backing us up and taking our side." The playful piece features a sterling silver mama bear with up to four bronze cubs in tow, capturing the strong bond and tender love a mother has for her little ones. It's a sparkling reminder that childrenno matter what ageneed their mother to help lead the way. 18-inch sterling silver chain. Handmade in Seattle, Washington. Learn more about how Britta is inspired by her mom, and other strong women, on the blog. I would buy this product repeatedly! Since buying this necklace my daughter just had another child and I was wondering if another baby bear could be added to her necklace? Thank you! Love the idea of it. My son bought for me. We were both very disappointed in the length. In your pictures on your website it shows many women wearing it and it lies nicely below collar bone. Yet when we received it it looked very short. Put it on and it fits like a choker! Very disappointed! I love this necklace! Bought it for my mom for Christmas and from the photos on here I thought it was going to be some large, clunky thing, but it's actually quite small and delicate - exactly what she likes! I'm so excited to give it to her. This Gift is Perfect for My Wife! This is a very meaningful gift for my wife as it represents her role as Mama bear to our three children and the bond we have formed with nature during our many walks in the woods of North America. The total length is actually 17". One inch makes a difference for our Rubenesque boss. It will literally be a choker. I have gotten more compliments on this necklace than anything else I have ever worn. I loved this necklace the moment I received it on Christmas morning from my son & daughter-in- law. It really touched my heart. I have received so many compliments from friends & strangers as well. People who don't speak English have told me how much they love it by touching their neck & then their heart with a big smile.